here's one for the blog of unneccessary apostrophe's, a close cousin of the blog of unwanted quotation "marks". Maybe it's referring to itself? 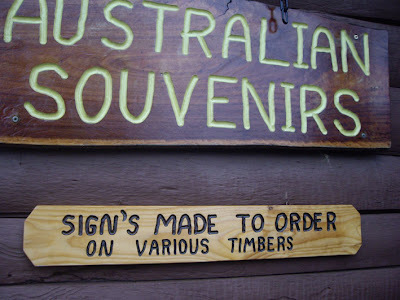 As in, "This sign is made to order, on various timbers"? And then everyone who owns a copy and knows rudimentary English grammar can use his copy as a conversation piece: "No, you see, this sign is referring to itself..."
... Puts me in mind of this comic by Joey Sayers.